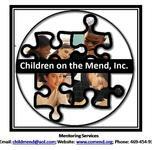 Welcome to Children on the Mend, Inc., a non-profit 501 (c) (3) charity organization. To impact the lives of young people by providing adult support and learning opportunities that promotes character development and life-enhancing values. COTM was founded in 2000, after I found myself having to navigate the juvenile judicial system, when my child made an error in judgment. Can you image a parent (s) pain, hurt and disappointment ? This is a parent (s) nightmare and was one of the worst feelings I had ever experienced. I vowed then to help other parents, who sometimes have children that go astray. Officially, as a non-profit in 2009. Our specialty is caring for disadvantaged youth and youth in general who may have given up on life. Thomas Edison once said " Many of life's failures are people who did not realize how close they were to success when they gave up." Our outreach services provides short and long term, holistic programming that is relevant to the needs of the population we serve. Just the right set of support for disadvantaged youth and young adults and youth in general to help them attain their dreams. Through education and informational symposiums, life skills, resources and counseling referrals, mentoring, tutoring, street outreach, mediation and positive role models. "Mending their lives together one step at a time." An agency model for breaking the cycle of giving up. Donations welcome by mailing to our PO Box and enjoy shopping and support us the Amazon smile. We are an all volunteer organization. Our initiatives are funded by the generous donations of volunteers and community supporters..